Results: A total of 535 patients diagnosed with CFS/ME by a primary care physician were identified. The mean age of all patients was 46.4 years (standard deviation 12.0); the majority were female (78.61%), Caucasian, and highly educated. Of these, 30.28% met Fukuda criteria. A further 31.96% met both Fukuda criteria and International Consensus Criteria. There were 14.58% reporting chronic fatigue but did not meet criteria for CFS/ME and 23.18% were considered noncases due to exclusionary conditions. Within those meeting CFS/ME criteria, the most common events prior to illness included cold or flu, gastrointestinal illness, and periods of undue stress. Of the 60 symptoms surveyed, fatigue, cognitive, and short-term memory symptoms, headaches, muscle and joint pain, unrefreshed sleep, sensory disturbances, muscle weakness, and intolerance to extremes of temperature were the most commonly occurring symptoms (reported by more than two-thirds of patients). Significant differences in symptom occurrence between Fukuda- and International Consensus Criteria-defined cases were also identified. Conclusion: This is the first study to summarize sociodemographic and illness characteristics of a cohort of Australian CFS/ME patients. This is vital for identifying potential risk factors and predictors associated with CFS/ME and for guiding decisions regarding health care provision, diagnosis, and management. Chronic fatigue syndrome/myalgic encephalomyelitis (CFS/ME) is a disabling condition that significantly interrupts individuals during critical years of social and economic productivity. The etiology or underlying mechanism of the illness has not been defined, and its diagnosis remains a challenge in the absence of a biological or clinical test. Diagnosis currently relies on differentiating between other diseases and disorders, as well as self-reported symptom-based criteria. It is most often characterized by Fukuda et al1 criteria that include medically unexplained fatigue that may be accompanied by cognitive difficulties, sleep disturbances, and flu-like symptoms. Alternative criteria, such as the International Consensus Criteria (ICC),2 disclose a further range of symptoms pertaining to the neurological, immunological, gastrointestinal, and autonomic systems. In the UK, Fukuda-defined cases have a prevalence of 0.2%.3 The economic consequence is estimated as GBP120.2 million annually due to lost productivity.4 In the US, the prevalence of Fukuda-defined cases has been reported between 0.2%5 and 0.4%,6 and is estimated to cost USD9.1 billion annually in productivity losses.7 This represents a sizeable economic burden for a select population. This cross-sectional study utilized responses to a survey during a 2-year period from April 2013 and April 2015. The survey was delivered to volunteers during their enrollment into a research database for CFS/ME managed by the National Centre for Neuroimmunology and Emerging Diseases within Griffith University. This database serves as a sampling pool for immunological and clinical research on CFS/ME as well as provides a cohort available for longitudinal follow-up. It commenced following approval from Griffith University Human Research Ethics Committee (HREC reference number MSC0413). Recruitment was based on self-identification in response to an advertisement in CFS/ME community support networks across Australia, as well as a general advertisement on local radio and social media. Upon contacting the research center, those interested in enrolling in the research database received an information pack and informed consent was obtained by agreeing to terms and conditions disclosed online or signing a hard copy sent in the mail. To be eligible for this study, participants were required to 1) report a diagnosis of CFS/ME by their primary physician, 2) be between 18 and 65 years of age, and 3) a resident of Australia. As recruitment relied on self-identification, it is unknown whether there was a difference between responders and nonresponders in this study. Rather than aim for a comprehensive population-based screening at this stage, the methods of this study enabled us to summarize potential cases of CFS/ME present in the Australian community. Participants completed a self-report survey regarding their medical history. This was made available through an online link or by hard copy in the mail. Items in the study questionnaire were developed by the authors, and participants were asked to disclose sociodemographic details, medical history, and complete a 60-item checklist on their fatigue and concurrent symptoms. Responses were collected using an online survey application known as LimeSurvey (Carsten Schmitz, Hamberg, Germany),12 and stored on a secure server hosted by Griffith University. Data from hard copy versions of the study questionnaire returned to the research center by mail were subsequently entered into the LimeSurvey application by a member of the research team to consolidate all responses. All personal data were encrypted to remove the identity of participants. The disclosed medical history of participants was reviewed by the authors to exclude any potential diagnoses or conditions that may be an alternative explanation for symptoms. This included, but was not limited to, major heart disease, neurological disorders such as multiple sclerosis, autoimmune disease such as rheumatoid arthritis and diabetes, and thyroid disorders. These exclusionary conditions were reviewed by an author of the study who has extensive clinical experience with CFS/ME. If reported, these participants were classified as noncases. To be reported as a case of CFS/ME, reported symptoms had to comply with study criteria for fatigue and accompanying symptoms according to the Fukuda and/or ICC definitions that are outlined in Table 1. For this study, fatigue must have been present for at least 6 months. Patients accompanying symptoms should not have preceded the onset of fatigue and also be persistent or recurring for at least 6 months. The study reported the presence of postexertional malaise and postexertional neuroimmune exhaustion. To meet criteria for postexertional neuroimmune exhaustion, patients must have reported experiencing all of the following after minimal activity: 1) marked postexertional fatigue, 2) postexertional symptom exacerbation, 3) onset of fatigue can be immediate or delayed, 4) prolonged recovery period of usually 24 hours or longer, and 5) lack of stamina (substantial reduction in premorbid activities). Notes: aSymptoms accompanying fatigue should not have preceded onset of fatigue and be persistent or recurring. bFatigue described as PENE. Abbreviations: CCC, Canadian Consensus Criteria; CFS/ME, chronic fatigue syndrome/myalgic encephalomyelitis; ICC, International Consensus Criteria; PENE, postexertional neuroimmune exhaustion. It was observed that participants could be placed in three categories. Fukuda cases were participants who reported symptoms that only fulfilled Fukuda criteria and not the ICC. ICC cases fulfilled both the Fukuda and ICC criteria but for the purposes of comparison were referred to as ICC cases in this study. There was an exception of four participants who only met ICC, but were excluded from analysis due to lack of statistical power. The remainder of participants reported chronic fatigue (CF) for at least 6 months but did not meet either CFS/ME criteria due to lack of accompanying symptoms. These were considered atypical and reported as cases of CF (Figure 1). Hence, the primary outcome of interest included the frequency of Fukuda cases, ICC cases, CF cases, and noncases. Figure 1 Flowchart for case ascertainment. BMI was classified according to the World Health Organization15 global database on BMI. Accordingly, underweight was considered <18.5 kg/m2, normal 18.5–24.9 kg/m2, overweight 25.0–29.9 kg/m2, and obese ≥30.0 kg/m2. With regard to ethnicity, participants were classified according the ABS Australian classification for cultural and ethnic groups.16 This included nonindigenous Australian, indigenous Australian, Oceanian (New Zealand, Melanesian, Papuan, Micronesian, and Polynesian), North West European, Southern and Eastern European, North African and Middle Eastern, South East Asian, North East Asian, Southern and Central Asian, People of the Americas, and Sub-Saharan African. Participant education was categorized according to the highest level of education completed. In terms of employment, full-time hours were defined as 35 hours per week or more and part-time hours were considered <35 hours per week in accordance with the ABS Labour Force Survey.17 Participants were further classified as those on disability pension, retired, and unemployed. Of 600 respondents, a total of 535 participants met the inclusion criteria. Figure 2 presents the distribution of participants per state as well as the distribution of the Australian population per state for comparison. The majority of participants were from Queensland, followed by New South Wales, and Victoria and 91.89% had postcodes corresponding to major urban regions of Australia. Figure 2 Frequency of participants in the CFS/ME registry by state. Note: Figures correspond to the distribution of participants per state (distribution of the Australian population per state). Abbreviations: ACT, Australian Capital Territory; CFS/ME, chronic fatigue syndrome/myalgic encephalomyelitis; NT, Northern Territory; NSW, New South Wales; QLD, Queensland; TAS, Tasmania; VIC, Victoria; SA, South Australia; WA, Western Australia. Of 535 individuals assessed, CFS/ME as characterized by the Fukuda criteria was evident in 30.3%. A further 32.0% met both Fukuda criteria and the ICC and referred to as ICC-defined cases for comparison. In all, 23.2% were classified as CF, as they met criteria for CF but did not report sufficient symptoms to meet the Fukuda or ICC definitions. The remaining 14.6% reported an alternative physical or psychological diagnosis that accounted for their symptom profile and were thus classified as noncases. 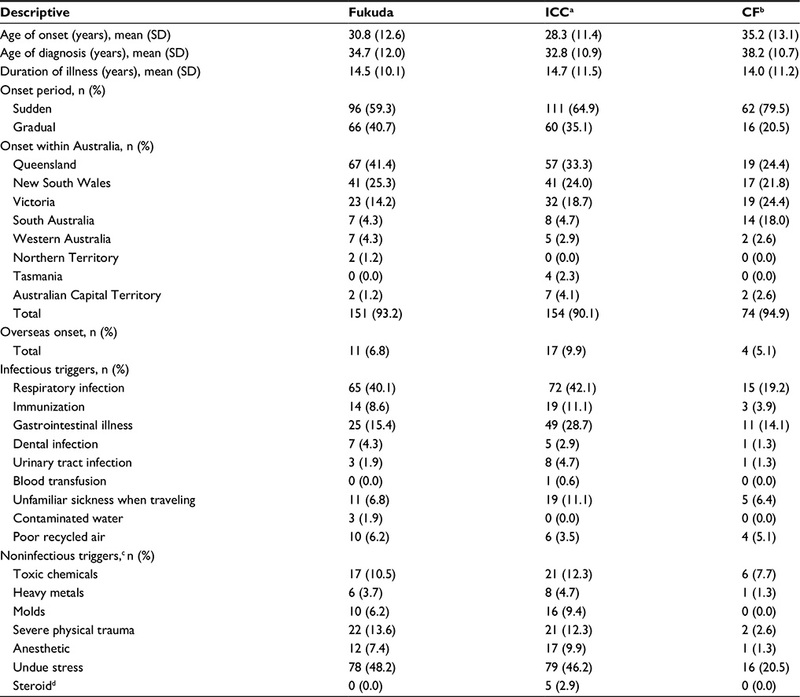 The sociodemographic characteristics of Fukuda cases, ICC cases, CF, and noncases are summarized in Table 2. In total, the highest proportion of participants were nonindigenous Australian (total 74.4%), female (total 78.6%), with a mean age of 46.4 years (standard deviation 12.0). A total of 47.5% of participants were within a normal range for BMI. A higher proportion of individuals had completed either undergraduate (27.9%) or postgraduate (18.1%) university degrees. The majority of participants were on disability pension (34.2%) or unemployed (26.7%), while the lowest proportion maintained full-time roles (9.7%). The distribution of the aforementioned characteristics was similar between study groups. Abbreviations: BMI, body mass index; CF, chronic fatigue; ICC, International Consensus Criteria; ME, Middle Eastern; NA, North African; NW, North West; SC, South or Central; SD, standard deviation; SE, South East. 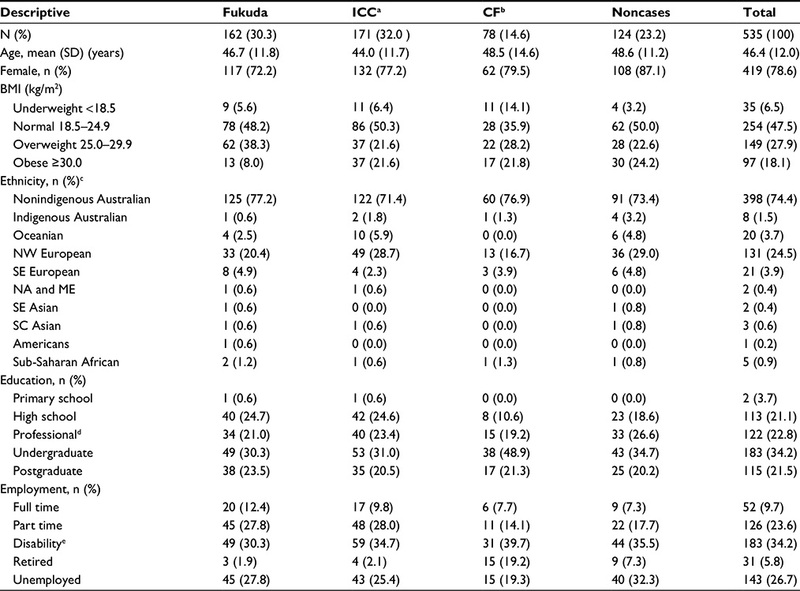 Table 3 summarizes the onset characteristics of Fukuda, ICC, and CF cases. The mean age of illness onset for Fukuda (P=0.030)- and ICC (P<0.001)-defined cases was significantly younger in comparison to CF. Across all groups, the highest proportion of cases originated in Queensland. More than 5% of cases across all groups originated overseas. The most common reported infectious events were cold and flu, upper respiratory infections, and gastrointestinal illness. Furthermore, the most common noninfectious trigger reported was periods of undue stress. Notes: aICC group met both Fukuda and ICC criteria. bCF only. cPercentage does not add to 100 with participants reporting more than one trigger. dPrescription due to acute respiratory illness. Abbreviations: CFS/ME, chronic fatigue syndrome/myalgic encephalomyelitis; CF, chronic fatigue; ICC, International Consensus Criteria; SD, standard deviation. 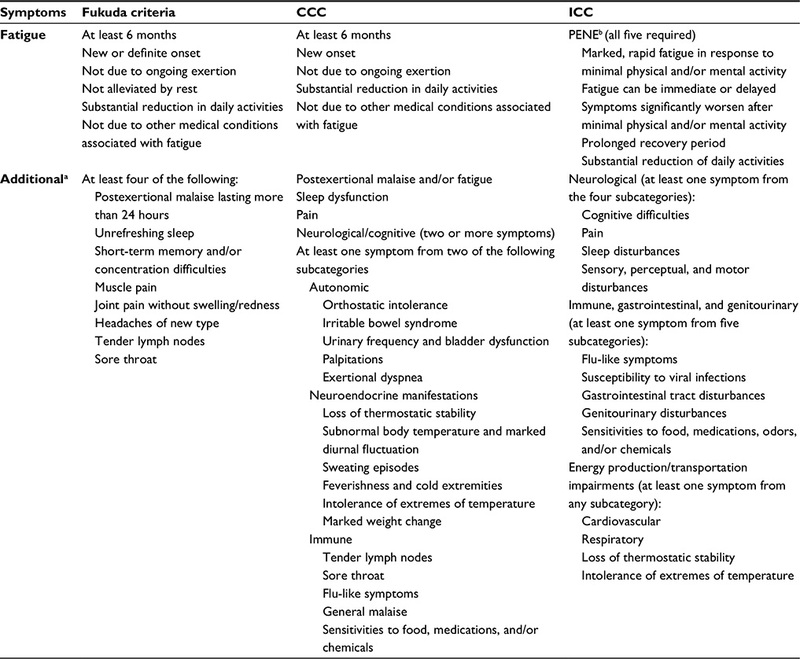 Reported symptoms of Fukuda, ICC, and CF cases are included in Table 4. The most common symptoms reported by more than two-thirds of both Fukuda- and ICC-defined cases included fatigue; cognitive overload; difficulty making decisions; short-term memory problems; headaches; muscle pain; joint pain; unrefreshed sleep; sensitivities to light, noise, vibration, odors, taste, and/or touch; light headedness; and intolerances to extremes of temperature. A significantly higher proportion of ICC-defined cases reported postexertional neuroimmune exhaustion, postexertional malaise, disorientation, slowed speech, abdominal pain, reversed sleep cycles, vivid dreams or nightmares, sensitivities, poor depth perception, feeling unsteady on their feet, sore throat, food intolerances, urinary disturbances, light headedness, abnormal body temperature, recurrent feverishness, and cold extremities. Notes: aICC group met both Fukuda and ICC criteria. bCF only. cOR, 95% CI. dFatigue not due to ongoing exertion and significantly interferes with daily activities and work for at least 6 months. ePENE defined as the following symptoms after minimal activity: 1) marked postexertional fatigue, 2) postexertional symptom exacerbation, 3) onset of fatigue can be immediate or delayed, 4) prolonged recovery period of usually 24 hours of longer, and 5) lack of stamina (substantial reduction in premorbid activities). fSensitivity to light, noise, vibration, odor, taste, and/or touch. gIrritable bowel described as abdominal pain, bloating, and alternating constipation and diarrhea. hIntolerance to food, medications, odors, or chemicals. iSelf-reported diagnosis. Abbreviations: CFS/ME, chronic fatigue syndrome/myalgic encephalomyelitis; CF, chronic fatigue; CI, confidence interval; ICC, International Consensus Criteria; OR, odds ratio; PENE, postexertional neuroimmune exhaustion. This study was performed to review the sociodemographic and illness characteristics of CFS/ME patients within Australia. The key findings of this study include 1) the frequency of Fukuda-, ICC-, and CF-defined cases; 2) sociodemographic characteristics that have not been previously reported in an Australian sample according to current definitions of CFS/ME; 3) the average age of onset, diagnosis, and common infectious and noninfectious events prior to onset; and 4) a high frequency of varied symptoms experienced by patients and significant differences between Fukuda- and ICC-defined patient sets. The functional impact of the illness is also evident in the significantly high proportion of individuals who are unemployed, on disability pension, or maintain part-time roles. This is of particular concern considering many are still in the most economically and socially productive years of their lives and, thus, represents significant economic losses at both the population and patient level. This reduced economic position adds further to the stress, anxiety, or depression that may develop with a chronic condition, particularly in those patients who are bedridden or housebound for protracted periods of time and receive limited support. This study identified the most common symptoms reported by patients representing Fukuda- and ICC-defined cases. Cognitive issues such as difficulty processing information, muscle pain and muscle weakness, sleep disturbances, and sensitivities to light, noise, vibration, odor, and/or touch in particular were the most common issues reported by more than two-thirds of both Fukuda- and ICC-defined cases. Food intolerances, urinary disturbances, and intolerance of extreme temperature were also highly prevalent among ICC-defined cases (more than two-thirds) and could be considered distinguishing features in comparison to Fukuda-defined cases. The results of this study may not be representative of all CFS/ME patients in the general population given that the sample was not from a community-based survey. As this study summarized patients who are currently experiencing illness, those who consider themselves recovered are not represented by this study. Such a sample may exhibit different illness characteristics that have not been well summarized in the literature. Due to the cross-sectional design of this study, it is also not known whether participants who were not considered cases of CFS/ME developed exclusionary conditions after an initial diagnosis of CFS/ME by a physician. As such, reporting on improvement, recovery, and development of other conditions will be a future aim as this cohort become available longitudinally. A limitation is reliance on reported symptoms for case ascertainment; however, the methods of this study remain important as an initial screening tool to identify cases of CFS/ME. Methods such as the recruitment of patients from general practitioner databases may not have been as successful as self-identification of a largely unrecognized and misdiagnosed condition. Furthermore, contrary to typical patterns of chronic disease where the most severe cases present to primary care, severe cases of CFS/ME may be less likely to present to primary care due to being bedridden. Further, a consultation with a primary care professional is limited as there currently remains no successful therapy for the illness. This information is intended to guide decision makers and clinicians on what patient and illness characteristics may be expected when potential cases of CFS/ME arise. To improve understanding on the prognosis of CFS/ME, future directions aim to follow-up those patients recruited in this study longitudinally as a prospective cohort. This will capture not only changes in employment status but also the pattern of symptomatology. Symptom severity and the functional impact of the illness will also be monitored. The alignment of this clinical severity with laboratory findings will be particularly valuable for identifying potential biological markers and the etiology or pathomechanism behind this illness. This study has identified a significant cohort of Australians who fulfill CFS/ME definitions having substantially low rates of full-time employment and in high need of improved health care support. Respiratory infections and gastrointestinal illness, as well as periods of undue stress, were common events prior to the onset of their illness. Those meeting the ICC definition further appear to represent a distinct clinical group with distinguishing symptoms. The improved characterization of Australian CFS/ME will help guide decisions in diagnosis, management, and health service provision. This work was supported by the Alison Hunter Memorial Foundation, Change for ME, Mason Foundation, the Stafford Fox Medical Research Foundation, the Edward P Evans Foundation, and the Queensland Government Co-Investment Program. Fukuda K, Straus SE, Hickie I, Sharpe MC, Dobbins JG, Komaroff A. The chronic fatigue syndrome: a comprehensive approach to its definition and study. International Chronic Fatigue Syndrome Study Group. Ann Intern Med. 1994;121(12):953–959. Carruthers BM, van de Sande MI, De Meirleir KL, et al. Myalgic encephalomyelitis: International Consensus Criteria. J Intern Med. 2011;270(4):327–338. Collin SM, Crawley E, May MT, Sterne JA, Hollingworth W. UK CFS/ME National Outcomes Database. The impact of CFS/ME on employment and productivity in the UK: a cross-sectional study based on the CFS/ME national outcomes database. BMC Health Serv Res. 2011;11(1):217. Reyes M, Nisenbaum R, Hoaglin DC, et al. 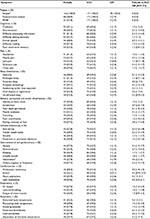 Prevalence and incidence of chronic fatigue syndrome in Wichita, Kansas. Arch Intern Med. 2003;163(13):1530–1536. Jason LA, Richman JA, Rademaker AW, et al. A community-based study of chronic fatigue syndrome. Arch Intern Med. 1999;159(18):2129–2137. Reynolds KJ, Vernon SD, Bouchery E, Reeves WC. The economic impact of chronic fatigue syndrome. Cost Eff Resour Alloc. 2004;2(1):4. 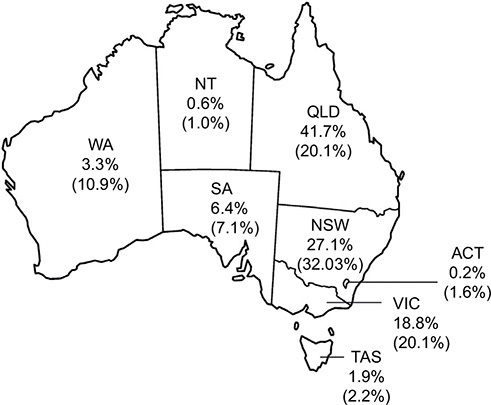 Lloyd AR, Hickie I, Boughton CR, Spencer O, Wakefield D. Prevalence of chronic fatigue syndrome in an Australian population. Med J Aust. 1990;153(9):522–528. Lloyd AR, Pender H. The economic impact of chronic fatigue syndrome. Med J Aust. 1992;157(9):599–601. Working Group of the Royal Australasian College of Physicians. 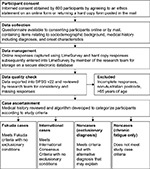 Chronic fatigue syndrome clinical practice guidelines. Med J Aust. 2002;176:S23. Vandenbroucke JP, von Elm E, Altman DG, et al. Strengthening the Reporting of Observational Studies in Epidemiology (STROBE): explanation and elaboration. Ann Intern Med. Oct 16 2007;147(8):W163–194. LimeSurvey: An Open Source Survey Tool [computer program]. 2012. Carsten Schmitz, Hamberg, Germany. Australian Bureau of Statistics. Australian Statistical Geography Standard: Significant Urban Areas, Urban Centres and Localities. Canberra: Australian Government; 2012. Australian Bureau of Statistics. Australian Demographic Statistics. Canberra: Australian Government; 2015. World Health Organization. Global Database on Body Mass Index; 2006. Available from: http://apps.who.int/bmi/index.jsp?introPage=intro_3.html. Accessed August 24, 2015. Australian Bureau of Statistics. Labour Force Commentary September 2013. Canberra: Australian Government; 2013. Carruthers BM, van de Sande M, De Meirleir K, et al. Myalgic Encephalomyelitis – Adult & Paediatric: International Consensus Primer for Medical Practitioners. Canada: Carruthers & van de Sande; 2012. IBM Statistics Package for Social Sciences for Windows Version 22.0 [computer program]. Armonk, NY: IBM Corp.; 2013. Brown AA, Jason LA, Evans MA, Flores S. Contrasting case definitions: The ME International Consensus Criteria vs. the Fukuda et al. CFS Criteria. N Am J Psychol. 2013;15(1):103–120. Johnston SC, Brenu EW, Hardcastle SL, Huth TK, Staines DR, Marshall-Gradisnik SM. A comparison of health status in patients meeting alternative definitions for chronic fatigue syndrome/myalgic encephalomyelitis. Health Qual Life Outcomes. 2014;12:64. Steven ID, McGrath B, Qureshi F, Wong C, Chern I, Pearn-Rowe B. 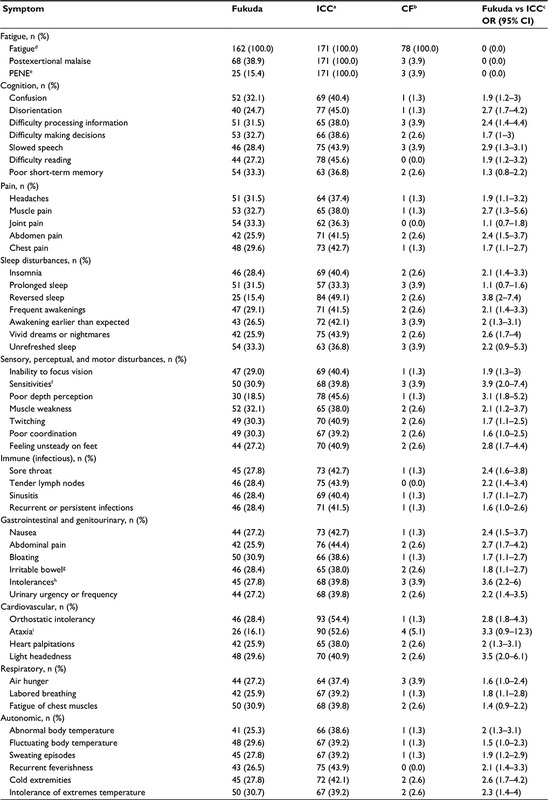 General practitioners’ beliefs, attitudes and reported actions towards chronic fatigue syndrome. Aust Fam Physician. 2000;29(1):80–85. Bowen J, Pheby D, Charlett A, McNulty C. Chronic fatigue syndrome: a survey of GPs’ attitudes and knowledge. Fam Pract. 2005;22(4):389–393. Raine R, Carter S, Sensky T, Black N. General practitioners’ perceptions of chronic fatigue syndrome and beliefs about its management, compared with irritable bowel syndrome: qualitative study. BMJ. 2004;328(7452):1354–1357. Johnston SC, Brenu EW, Staines DR, Marshall-Gradisnik SM. The role of clinical guidelines for chronic fatigue syndrome/myalgic encephalomyelitis in research settings. Fatigue. 2014;2:28–39. Drachler ML, Leite JC, Hooper L, et al. The expressed needs of people with chronic fatigue syndrome/myalgic encephalomyelitis: a systematic review. BMC Public Health. 2009;9(1):458. Reyes M, Gary HE, Jr., Dobbins JG, et al. Surveillance for chronic fatigue syndrome – four U.S. cities, September 1989 through August 1993. MMWR CDC Surveill Summ. 1997;46(2):1–13. Lawrie SM, Pelosi AJ. Chronic fatigue syndrome in the community. Prevalence and associations. Br J Psychiatry. 1995;166(6):793–797. Galdas PM, Cheater F, Marshall P. Men and health help seeking behaviour: literature review. J Adv Nurs. 2005;49(6):616–623. van’t Leven M, Zielhuis GA, van der Meer JW, Verbeek AL, Bleijenberg G. Fatigue and chronic fatigue syndrome-like complaints in the general population. Eur J Pub Health. 2010;20(3):251–257. Flores S, Brown A, Adeoye S, Jason LA, Evans M. Examining the impact of obesity on individuals with chronic fatigue syndrome. Workplace Health Saf. 2013;61(7):299–307. Reyes M, Dobbins JG, Nisenbaum R, Subedar NS, Randall B, Reeves WC. Chronic fatigue syndrome progression and self-defined recovery: evidence from the CDC surveillance system. J Chronic Fatigue Syndr. 1999;5(1):17–27. Hickie I, Davenport T, Wakefield D, et al. Post-infective and chronic fatigue syndromes precipitated by viral and non-viral pathogens: prospective cohort study. BMJ. 2006;333(7568):575. Glaser R, Kiecolt-Glaser JK. Stress-associated immune modulation: relevance to viral infections and chronic fatigue syndrome. Am J Med. 1998;105(3):35S–42S.